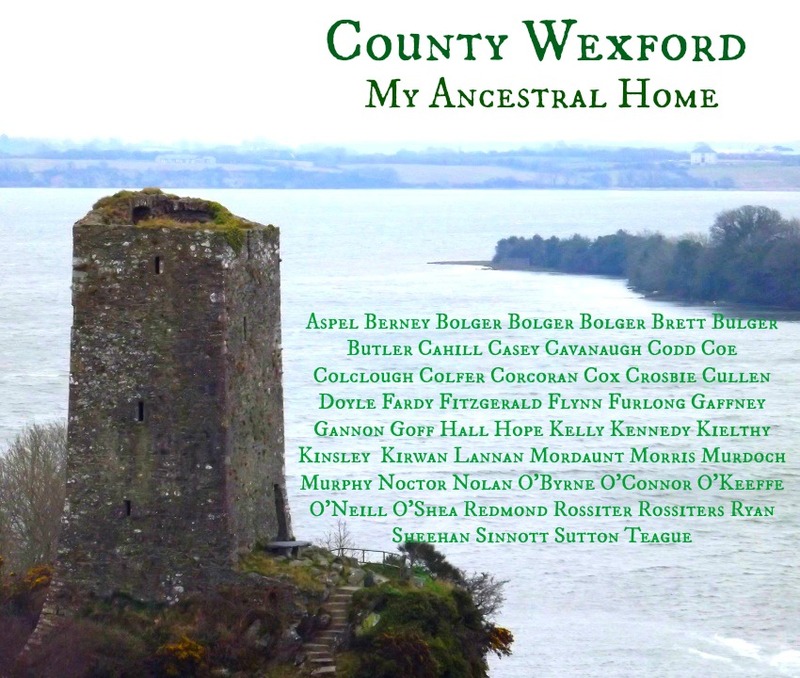 These are the surnames of our readers whose ancestors came from County Wexford. Is your County Wexford surname here? Like to add your County Wexford surname to our list? Just signup for your free weekly Letter from Ireland by clicking here. – and we’ll let you know how to join in the fun. And this is a picture of a Roche Castle (not included in our list – before you ask – because none of our Roche readers come from Wexford!). It is Ferrycarrig at the mouth of the River Slaney near to Wexford town. Bolger! My granny was a Bolger but, unfortunately, from Kildaire. It’s been difficult to find her background. It was thrilling to see her maiden name posted even in Wexford! Glad I left it in 3 times by mistake for your sake Joan! Bolger is originally from the Wexford area (from the Irish Ó Bolguidhir) – but is found in many places along the eastern side of the country. Mike. I can not find my Original family in Ireland or how they got here to the USA. Hi, I was so glad to see the name Sheehan. I haven’t been able to find much info on the Sheehans in my family. I’d love to know more! Hi Paula – Sheehan is a name that you will find throughout Limerick, Cork and Kerry. It comes from the Irish Ó Siodhacháin. Hope thisgets you started. Mike. My ancestor Edward Sinnott , son of William Sinnott & Jane O’Neil , came to Gaspe..province of Quebec. Canada. 1778 . I see my Great Grandfathers name one this list, Nolan, but I keep finding info that says he was from County Carlow. Does the name show up in both or is my info wrong? Both are right Rebecca – there are the names of our READERS from these counties. Mike. I’m looking for McDonald (McDonnell), Roche, Byrne, Fanning, Murphy, Rooney in and around Enniscorthy in Co Wexford. We have traced them to there around 1830 but have lost them before that date and after. I’ve heard that Fanning (my surname) is originally from Tipperary? If so, why would they migrate to Wexford? Hi Jim – I have added your names to our list. On the Fanning question – the answer is all sorts of reasons – usually related to livlihood! And its not that far. Mike. Hi Elen – Rossiter is an English name that has been in Ireland from the 1200s. It is mostly found in County Wexford. Mike. Very neat!!!! I haven’t been able to find any history on my surname! I am a descendant of “Furlong” from Bannon, County Wexford, Finding it tough to find anything on this family or the area. I am a descendant of the Furlongs of Enniscorthy, Wexford. I have traced back to: Michael Furlong and Eleanor ? My Name is Dennis Kent Donlan and I am looking for information on the name ASPEL. My 3 times Grandfather, Thomas Aspell and wife Mary Ann Sheridan came to New Orleans,LA in 1851 and came from Inniscorthy, Wexford ,Ireland . They then moved went Chicago,IL. There daughter Mary Aspel Married John McDonald. Their Daughter Josephine Married Joseph E. Walsh whose Daughter Helen Walsh Married Francis B. Donlan .They were my Parents. Any help would be greatly appreciated. I believe my Sinnett family was from County Wexford. My earliest known ancestor was Richard Sinnett/Senate/Sinnott who was apparently born in America by about 1750. He fought in the American Revolution under George Rogers Clark. I’m a Redmond with Wexford roots. I’m trying to trace the family and ancestors of Great-great-grandfather Andrew who emigrated to Canada in 1826. My genealogy explorations show Redmonds around the Hook peninsula and around Ferns. I read the Redmonds of Redmond Hall (later Loftus Hall) were sent packing by Cromwell, headed north, but there’s still a concentration in the southern part of the county as well. I think I’m from the northern branch but would love more information on the split. BTW records show Bulgers, Furlongs, Rossiters, and Sinnotts as witnesses for baptisms and marriages. Alice. Looks like you are well underway on your family search do join us in the Green Room for more in depth help and assistance.